Vukman, K. V., Metz, M., Maurer, M. and O’Neill, S. M. (2014). Isolation and Culture of Peritoneal Cell-derived Mast Cells. Bio-protocol 4(4): e1052. DOI: 10.21769/BioProtoc.1052. The generation of mast cells for in vitro studies comes from a variety of sources including mast cell lines (MC/9) (McCurdy et al., 2001), bone marrow-derived mast cells (BMMCs) (Supajatura et al., 2001), skin-derived mast cells (FSMCs) (Matsushima et al., 2004), peritoneal-derived mast cells (PMCs) (Hochdorfer et al., 2011) and peritoneal cell-derived cultured mast cells (PCMCs) (Vukman et al., 2012). PCMCs are generally used for in vitro studies because they are a more mature source of mast cells when compared to mast cells generated or obtained from other sources. They can differ, for example, in their pro-inflammatory responses to bacterial antigens and toll like receptors (TLRs) ligands (Mrabet-Dahbi et al., 2009). In comparison to BMMCs [see the protocol “Isolation and Culture of Bone Marrow-derived Mast Cells” (Vukman et al., 2014)] or mast cell lines they express a wider range of TLRs, and secrete significantly more cytokines when stimulated with TLR ligands (Mrabet-Dahbi et al., 2009). Therefore, when examining pro-inflammatory responses, mast cells generated from cells obtained from the peritoneal cavity give stronger responses. PCMCs can also be generated from knockout and transgenic mice making them a good source to examine specific factors important for mast cell function. However, due to the low yield of cells generated using this method (1 million per mouse) their use is restricted and therefore in most studies more than one source of mast cells may be required. The different sources of mast cells can display phenotypical and functional differences and therefore it is important that when designing an experiment, the correct cellular source is obtained. Here, we describe a protocol for the isolation and culture of murine mast cells from peritoneal cavity cells. Note: All procedures are done in sterile environment in a safety cabinet. Make a small incision below the sternum of the mouse and peel the fur back from the chest. Be careful not to puncture the peritoneum. Use sterile scissors and tweezers. Inject 1 ml air and 10 ml ice cold sterile PBS into the peritoneal cavity of the mouse using 10 ml syringe with a 19-gauge needle. Note: 1:1 mixture of air and PBS can also be used to avoid leaking. Do not remove the needle. Give 30 sec massage on two sides of the mouse with fingers. Be careful not to push too hard the mouse. Collect the PBS with the cells into a Falcon tube with the syringe. Note: Needle can be replaced for a bigger one to collect cells from the peritoneal cavity. Open the peritoneal cavity with new scissor and forceps and collect the rest of the PBS with a sterile pipette. Place the Falcon tube onto ice until centrifugation. Centrifuge cells at 4 °C with 300 x g for 10 min. Resuspend cells in 5 ml PBS per mouse. Resuspend cells in 5 ml medium [with 10 ng/ml IL-3 and 30 ng/ml SCF per two mice (approximately 1 million cells obtained per mouse)] and transfer them into a small culture flask. Put the flasks into the incubator (37 °C, 5% CO2). Remove non-adherent cells by discarding the medium and add 5 ml fresh medium (with 10 ng/ml IL-3 and 30 ng/ml SCF) to every flask. Put them back into the incubator (37 °C, 5% CO2). Add 5 ml fresh medium (with 10 ng/ml IL-3 and 30 ng/ml SCF) to every flask. PCMCs are the non-adherent cells and can be used for experiment. Cell number and viability can be measured with trypan blue staining in haemocytometer. Purity can be tested with Kimura staining by mixing the cell suspension and Kimura dye (1:1) and after 5 min at 37 °C count cells under a light microscope. Mast cells will be stained red/purple (Kimura et al., 1973). Note: Expected cell number is 0.5-1.5 x 106 PCMC/mouse after culturing. Purity is > 95% (Figure 1). Figure 1. The purity of peritoneal-derived cultured mast cells is over 95% after 9 days of cultivation. Peritoneal cells were cultured for 9 days in complete RPMI medium in the presence of 10 ng/ml IL-3 and 30 ng/ml SCF. Purity was assessed on the basis of APC-conjugated c-kit and Fitc congugted-FcεRI cell surface expression measured by flow cytometry as previously described (Vukman et al., 2013). A: unstained control; B: double stained sample. Note: Heat and vortex for 30 min. The protocol described here was used in and adapted from the following publication (Vukman et al., 2012). Kimura I., Moritani Y. and Tanizaki Y. (1973). Basophils in bronchial asthma with reference to regain-type allergy. Clin Allergy 3(2):195-202. Vukman, K. V., Metz, M., Maurer, M. and O'Neill, S. M. (2014). 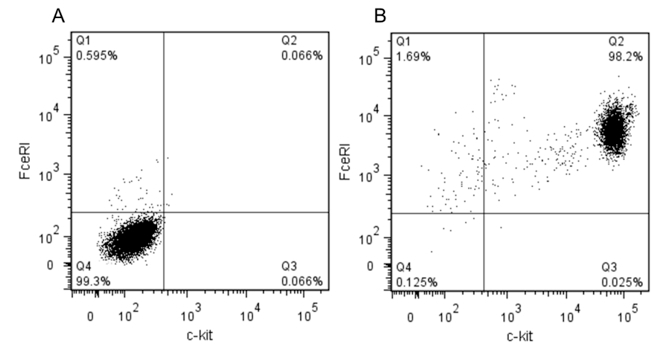 Isolation and culture of bone marrow-derived mast cells. Bio-protocol 4(4): e1053. How to cite: Vukman, K. V., Metz, M., Maurer, M. and O’Neill, S. M. (2014). Isolation and Culture of Peritoneal Cell-derived Mast Cells. Bio-protocol 4(4): e1052. DOI: 10.21769/BioProtoc.1052. On step 15 it says to discard non-adherent cells. Did you mean to spin down media and resuspend non adherent cells in fresh media and then plate into a new flasks?